Our journey through the archaeological heritage of Pennsylvania takes us to the central region of the state, Northumberland County. Located in the Ridge and Valley Physiographic Province the terrain is composed of long linear mountainous ridges and rich, fertile valleys in between these ridges. 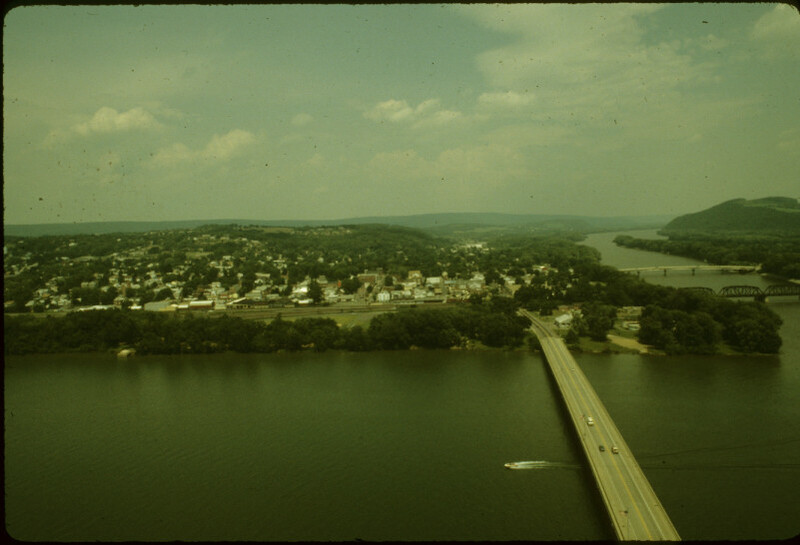 The Susquehanna River has cut a wider valley in the sandstone and shale bedrock which underlies much of the region. Lithic resources used by Native Americans include two chert formations, the Onondaga/Old Port formation and the Keyser formation. Stone tools are also frequently found in a fine grained, slightly metamorphosed material of unknown origin. The chert formations provided native peoples with brownish black to gray cherts for their stone tools. 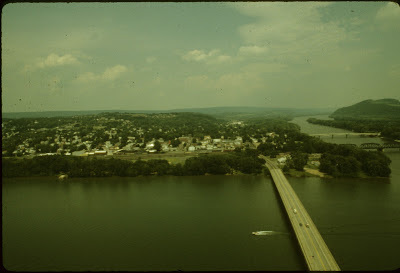 The location of this county on the Susquehanna River provided an opportunity to travel and trade for cherts from the surrounding areas as evidenced in archaeological materials recovered. The greatest percentages of sites recorded in the Pennsylvania Archaeological Site Survey files (PASS) are located in riverine settings; many of them are located along the Susquehanna. Indian foot paths which transected the area include the Tulpehocken Path, Penns Creek Path, Shamokin Path and the Wyalusing Path with additional secondary paths. These paths ran along the mountain ridges and valleys that form the topography of this county. It is difficult today to imagine that Northumberland County was considered a frontier area virtually unsettled until the 18th century. Established in 1772 as the tenth county organized in Pennsylvania it was created from an 8,000 square mile tract of land lying northwest of the counties of Lancaster, Cumberland, Berks, Northampton, and Bedford. 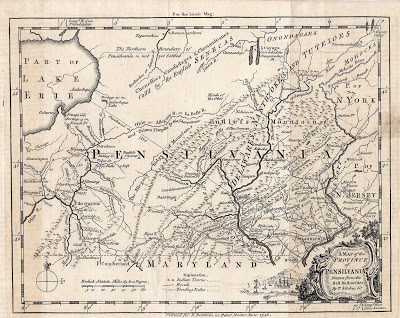 The land area of Northumberland County eventually increased to 15,000 square miles, covering the Susquehanna Valley, including all the land west of the Lehigh River to the Allegheny River and all of the land south of the New York State border to Juniata County. As the area grew and became more populated, the county was divided multiple times, which eventually led to the establishment of twenty-nine counties from this original 15,000 square mile tract of land. The PASS files list sites in all of the occupation time periods for this county and include six Paleoindian Period (10,000-16,500 years ago) sites. One of these sites was surfaced collected by locals for many years prior to a formal excavation for a Pennsylvania Department of Transportation bridge replacement project. An archaeological investigation conducted for the Allenwood Bridge Replacement project in the late 1980’s uncovered archaeological features from the Late Archaic/Transitional Period through the Late Woodland Period. 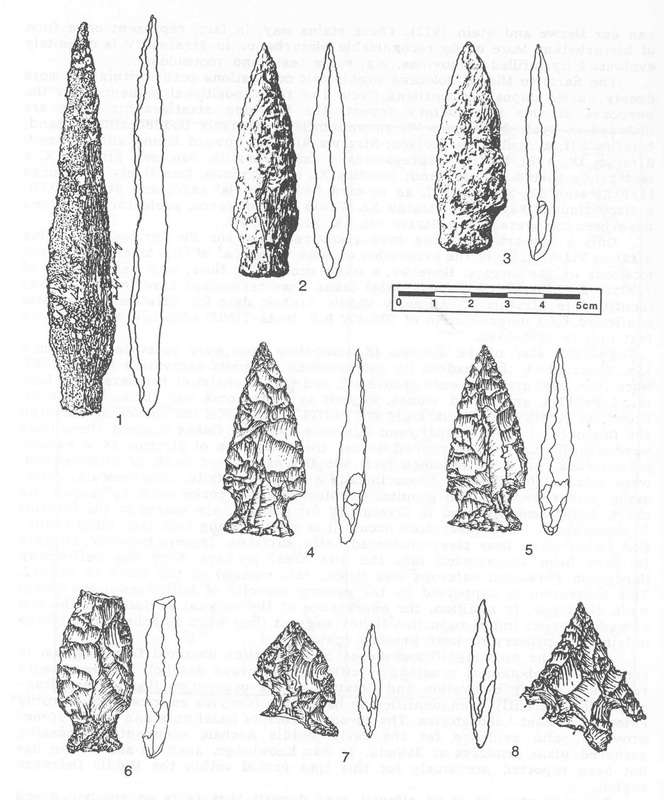 Evidence of the Late Archaic occupation included thirty-seven stemmed and side-notched points. Three burn features were identified and radiocarbon dated to between 2007 – 3367 years ago. These would place the occupations in the Transitional and Early Woodland periods. Archaeologists determined that the site was likely occupied for short periods, possibly in the fall as indicated by nutshell recovered in one of the features. The later occupation dates for this site were determined based on both radiocarbon dating and the recovery of associated prehistoric ceramics. Soil features included semi-circular post mold patterns interpreted as Clemson Island (circa 1000 AD) house patterns. An additional Late Woodland occupation was identified as Shenks Ferry based on ceramics recovered in a burn feature with a radiocarbon date of 1494±90 B.P. Two semi-subterranean keyhole structures were also identified and firmly dated to the Shenks Ferry culture time period (1400-1500 AD). 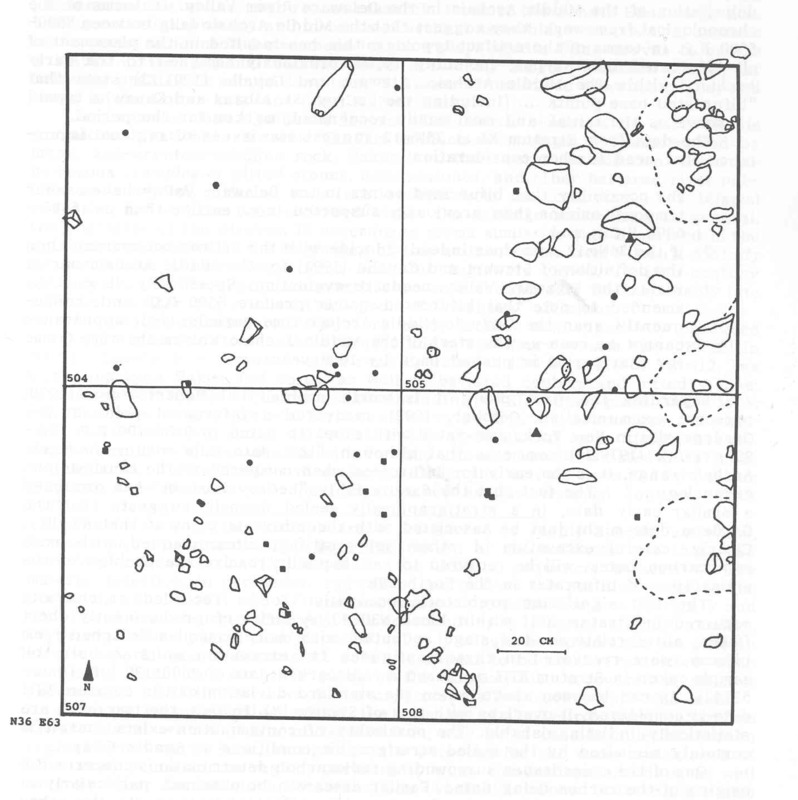 These keyhole structures are frequently found on the periphery of Late Woodland villages (Hatch1980), and it was surmised that these structures also represent the western periphery of a series of Late Woodland villages at 36Nb3. Agricultural remains recovered include maize, beans, grape seed and nutshell. 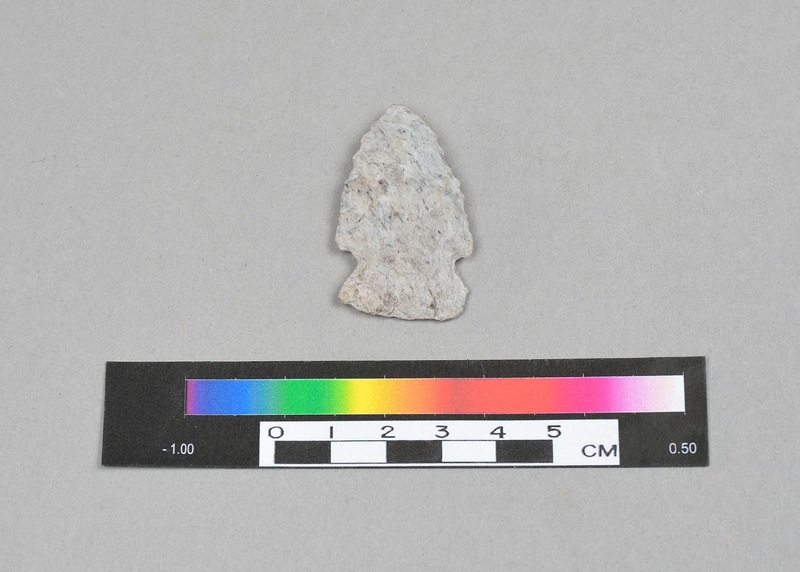 The excavation provided a wealth of information for Late Woodland occupations that furthered our understanding of these culture groups and led the way for additional specialized analysis of archaeological investigations. 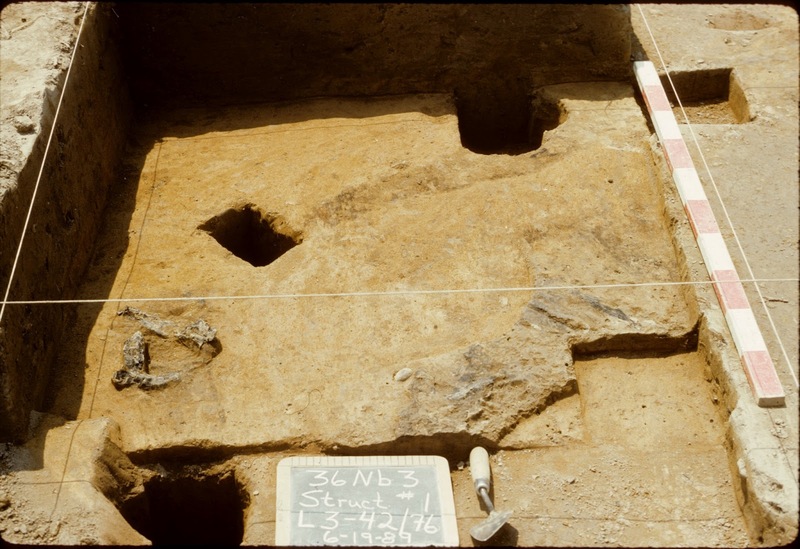 Excavations conducted by the Pennsylvania Historical & Museum Commission (PHMC) in the 1990’s uncovered additional evidence of another Late Archaic site. The Central Builders site (36Nb117) is located two miles from the confluence of the north and west branches of the Susquehanna River. 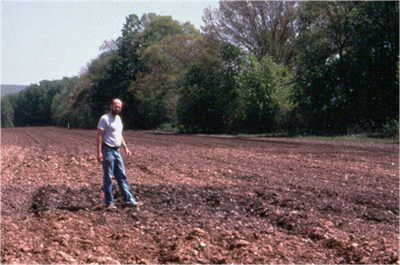 It was the location of the first Archaeology Week celebration in Pennsylvania in 1990. It attracted local attention because it contained a high concentration of artifacts on the site’s surface. The initial work consisted of a controlled surface collection and this produced thousands of artifacts dating from Early Archaic to Late Woodland times. During this process, a large Late Archaic fire-cracked-rock feature was located and partially excavated. The most significant data however, was uncovered during geomorphological testing. A short backhoe trench was placed on the levee in order to examine site stratigraphy of the soil. Near the bottom, at a depth of approximately nine feet, a few artifacts were uncovered including two large chert cores. Over the next several months, a two meter square was placed and excavated to the depth of the artifacts. At the level of the two cores, more artifacts were uncovered along with a metarhyolite Kirk corner notched projectile point and a small hearth. The charcoal from this hearth was radiometrically dated to 9165+210/-205 BP. The metarhyolite was carried 130 kilometers (80.7 miles) from its source in South Mountain near Gettysburg and demonstrates that Early Archaic bands were moving over and occupying large territories. Metarhyolite Kirk point recovered from Central Builder's site. Northumberland County played an important role during the French & Indian War (1755-1763). Fort Augusta (36Nb71), located at present day Sunbury, was the largest defensive fort established on the Susquehanna River. This was considered the western frontier at that time. Construction began in 1756 and improvements continued until 1758. It was the garrisoned the longest by provincial troops and provided Indian trade to the nearby village of Shamokin. After 1761 Augusta was the only provincial fort maintained in the commonwealth (Waddell & Bomberger 1996). Excavations conducted here under the Works Progress Administration (WPA) uncovered portions of the stockade and personal effects that provided evidence of foods and daily activities of the troops. The Commonwealth of Pennsylvania acquired a portion of the fort property in 1932 for the purpose of interpreting Fort Augusta’s history. Archaeological investigations on the site in 1938, 1978, 1979, 1981, and 1992 discovered elements of the fort’s stockade, officer’s quarters, north flanking wall, moat, and powder magazine, permitting placement of the fort on the modern landscape. Today visitors can view excavated artifacts and learn more about the fort in the Hunter Mansion, locally operated by the Northumberland County Historical Society under agreement with the PHMC. We would be remiss in not reporting on another of our PHMC properties in Northumberland County, the Joseph Priestley House. Joseph Priestley is most notable for his discovery in 1774 of oxygen while living in England. Very few people know that he relocated to Pennsylvania after his home and labs were burned because of his religious beliefs. Priestley’s support of the American Revolution and his opposition to the Angelican Church combined with support of the French Revolution led anti-French rioters to destroy his home burning his lab and extensive library in 1791. Priestley relocated in 1794 and died here in 1804. He was a noted theologian, political progressive and prolific author whose scientific contributions include the development of the carbonation process, the identification of carbon monoxide, and early experiments with electricity. Excavations conducted by the PHMC under the direction of Stephen G. Warfel at (36Nb70) recovered evidence of Priestley’s lab equipment. Archaeologists discovered the most important artifact assemblage recovered during the 1986 field season – 259 fragments of broken laboratory equipment. 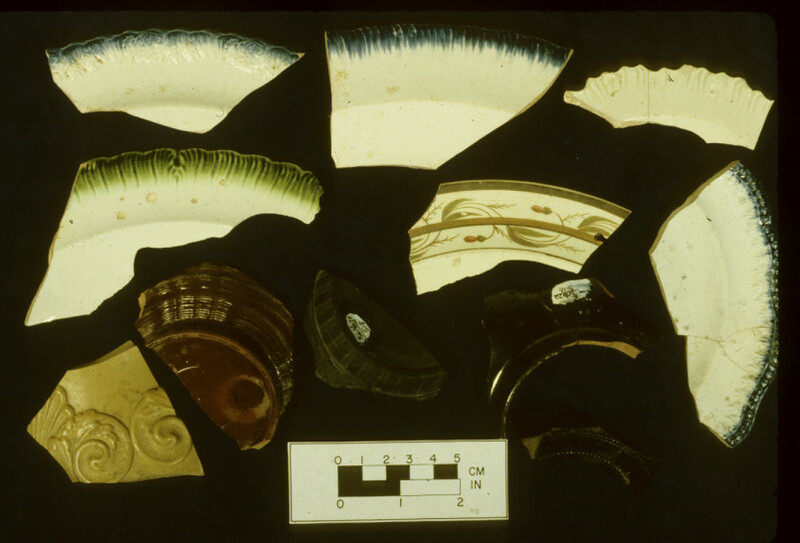 The fragments primarily consisted of earthenware tubes, some of which retained chemical residues. 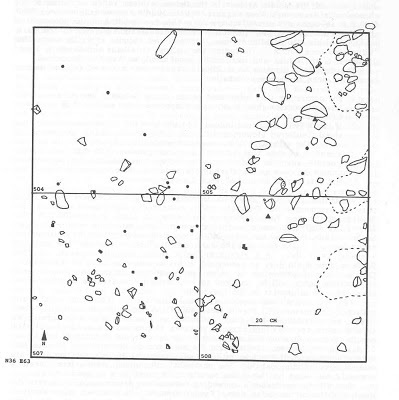 Analysis of a sample of these tube fragments and residues permitted speculative reconstruction of experiments Dr. Priestley had performed in his laboratory.“Characterization of the residues ... suggested that in all cases the labware was utilized at elevated temperatures and most likely in the presence of molten reactants” (Scheetz and Smith 1990). Experiments were clearly designed to produce oxygen, a finding consistent with Dr. Priestley’s efforts to defend his theory of phlogiston during the final years of his life (see Soloveichik 1962: 644-646.) The discovery of laboratory apparatus fragments in Test Pit 1, located in close proximity to the door and window of Dr. Priestley’s laboratory, is no coincidence. They were obviously discarded after breakage by being tossed through one or the other opening, a refuse disposal practice consistent with 18th century behavior. (Warfel 1997) The recovery of these laboratory artifacts and household goods provide tangible evidence of this important researcher and theologian. Visitors to the site can enjoy the house and reconstructed laboratory, furnishings include the fragments of his laboratory equipment and household furnishings. We hope you have enjoyed this journey through the rich archaeological heritage of Northumberland County and you will seek out the heritage of your community. Understanding and exploring our archaeological heritage is pivotal to our understanding of human behavior and our ability to change and adapt over time- just as the peoples of Northumberland County have done for thousands of years. The French and Indian War in Pennsylvania 1753-1763. Pennsylvania Historical and Museum Commission. Archaeological Data Recovery at Site 36Nb3, S.R. 0044, Section 004, Northumberland and Union Counties, Pennsylvania. 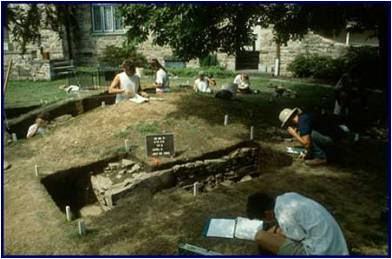 Unpublished manuscript files, Section of Archaeology, State Museum of PA.
1997 ARCHAEOLOGICAL INVESTIGATIONS AT THE JOSEPH PRIESTLEY HOUSE AND LABORATORY, 36 Nb 70, 1986 and 1992. This week we return to our long running county tour of archaeology by highlighting Northampton County, located in the extreme eastern part of Pennsylvania. Northampton County’s 377 square mile area is bordered on the east by the Delaware river and the great state of New Jersey. Its northern, northwestern, western and southern boundaries are marked by Monroe, Carbon, Lehigh and Bucks counties, respectively. Additionally, the principal watersheds that drain the mountain ridges and valleys of Northampton County are the Lehigh and Delaware rivers. Both of these watersheds form segments of the county’s boundary with New Jersey and Lehigh County. 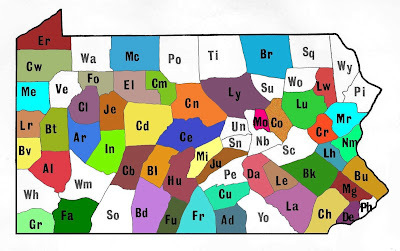 The physiography of Northampton County is divided into three parts, a northern Blue Mountain Section, a central Great Valley Section and a southern, Reading Prong Section. The former two Sections belong to the Ridge and Valley Province while the latter is a part of the New England Province that extends all the way into the state of Maine. Northampton County is made up of Ordovician, Cambrian and Pre-Cambrian limestone, shale, sandstone and other rock types. Some of these formations contained rocks that were used extensively by Native Americans to manufacture cutting and scraping tools and weapon tips. A review of the PASS files lists the dominant cryptocrystalline rocks used prehistorically as chert/flint, quartzite and jasper. These lithic types occur in bedrock and stream deposits of the Onondaga and Hardyston Formations. Extensive quarry sites containing some of these materials have been identified for Northampton and other surrounding counties. Less utilized lithics that have been found on some sites are quartz, found throughout the region and metarhyolite from the South Mountain region near Gettysburg. The county of Northampton was partitioned from parts of Bucks County in 1752. The county seat is Easton located at the confluence of the Lehigh and Delaware rivers. Easton became an important focal point in Pennsylvania history during the 18th century and a regional economy of the early 19th century. The Treaty of Easton, signed in 1758, was essentially an agreement between the British, Six Nations Iroquois, Delaware or Lenape and Shawnee specifying that the Indians, in the Ohio Country and elsewhere, would not side with the French so long as the British promised not to settle the frontier west of the Alleghenies once the French and Indian War ended. Conrad Weiser (1690-1770) interpreter and diplomat was the principal negotiator between the two sides at the Treaty of Easton. Miscellaneous projectile points (Sandts Eddy Site). Data Recovery Project by 3D/Environmental Inc.
By the late 18th century huge amounts of anthracite coal were being mined in and around Northampton County. It was, however, extremely difficult to transport coal via boat cross country until a network of water canals was built. One of these, the Lehigh Canal connected the towns of Mauch Chunk and Easton by way of the Lehigh Valley. Construction of other canals followed thereby connecting other cities and towns between New York and Philadelphia. The iron industry eventually followed which led to an economic benefit for the Lehigh Valley. There are 315 recorded archaeological sites listed in the PASS files for Northampton County. Over half of these sites are prehistoric with most stated as having a Late Archaic component. 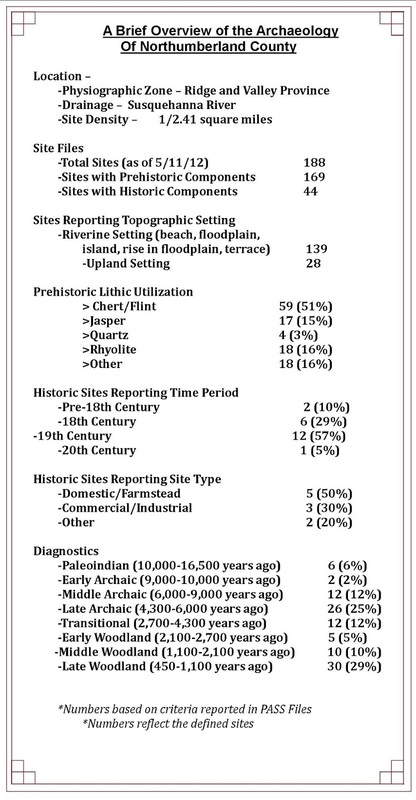 Quantitatively speaking, Late Archaic sites are followed by Late Woodland, Transitional, Middle Archaic, Early Woodland, Middle Woodland, Paleoindian and Early Archaic in that order of occurrence. The vast majority of these sites are located in upland settings followed by the use of sheltered valley bottom locations such as stream terraces, benches and floodplains. LeCroy Phase Living Floor (Sandts Eddy Site). Data Recovery Project by 3D/Environmental Inc.
One of the most important “valley bottom sites”, a first terrace setting, is the Sandts Eddy site 36NM12 located in Lower Mount Bethel Township, Northampton County near the village of Sandts Eddy. The site was initially investigated by members of the Forks of the Delaware Chapter 14, Society for Pennsylvania Archaeology, Inc., in 1969. Then between 1985 and 1988 Emanco Inc., undertook additional investigations at the site followed by a detailed data recovery project by 3D/ Environmental Inc., between 1991-1993. Coupled with the Chapter’s earlier excavations archaeologists identified an important sequence of stratified multi-component prehistoric occupations going back in time 9400 years. 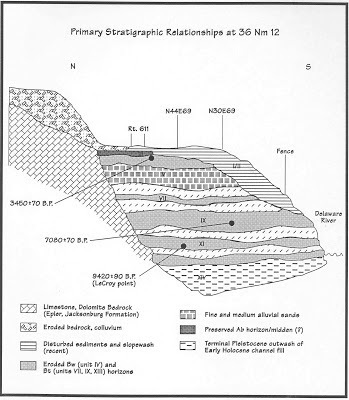 Stratigraphic profile (Sandts Eddy Site). Data Recovery Project by 3D/Environmental, Inc.
Four of the thirteen discrete soil strata contained prehistoric artifacts. Strata I and II revealed the most recent cultural artifacts consisting of Levanna and Jack’s Reef points and related tools. Strata IV and V were the living floors of Transitional and Late Archaic people and possibly segments of people of the Early-Middle Woodland Period. In Stratum XI, the deepest of all cultural bearing strata at Sandts Eddy, a LeCroy bifurcate point from a Middle Archaic occupation was recovered from a well defined living floor littered with flakes, cores and cobble tools. Most interesting, hazel nut shells from the floor yielded a date of 9420+/-90 years (Beta-51501). This dating of nut shell residue and pitted stones led archaeologists to broaden the antiquity of bifurcate points and the Middle Archaic Period in the Delaware Valley to a time period greater than had been reported for other regions of the Northeast. Alternatively, the surface that produced the date may have been exposed for a long period of time due to a low level of flooding and was occupied later by people who dropped the LeCroy point. 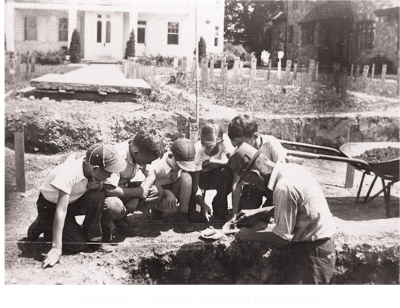 The Forks of the Delaware Chapter, Society for Pennsylvania Archaeology which holds its monthly meeting at the Palmer Library in Easton has been a long standing supporter of preserving Pennsylvania’s past through lectures and excavations. 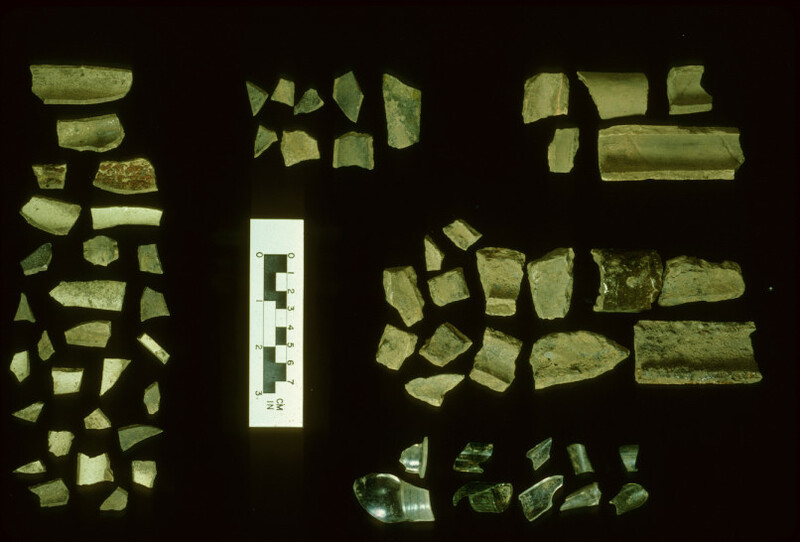 In 2005, Virginia Lopresti exemplified the Chapter’s philosophy of sharing the past with the present when she donated a part of her site collection from 36NM11 to The State Museum of Pennsylvania’s Section of Archaeology. This generous donation which filled a gap in our knowledge of Northampton County prehistory would not have been realized were it not for Virginia and her late husband, Joe’s interest in Pennsylvania archaeology. We hope you have enjoyed this brief journey through Northampton County’s prehistory. 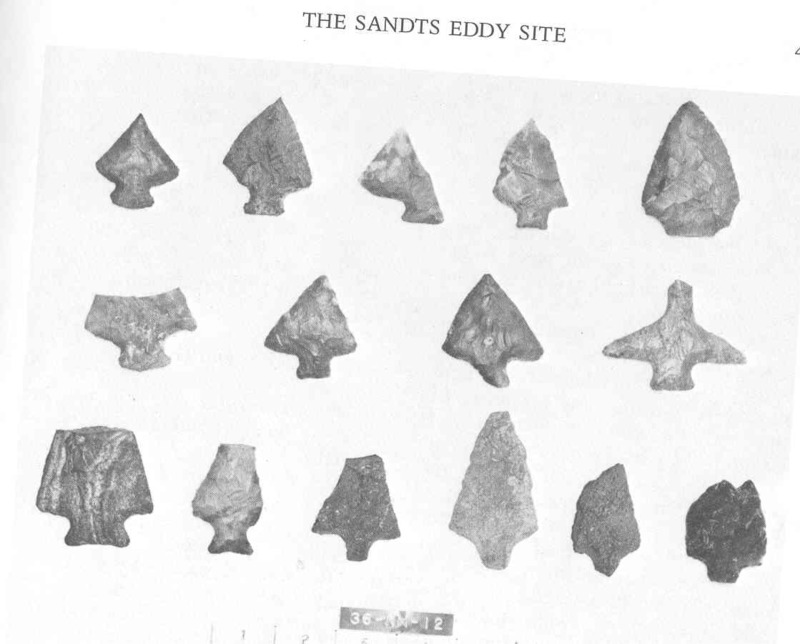 Hopefully it will inspire you to seek such publications as the Sandts Eddy report listed below or any of the journal articles on archaeology conducted in Northampton County and published in the Pennsylvania Archaeologist. Understanding and exploring our archaeological heritage is pivotal to our understanding of human behavior and our ability to change and adapt over time- just as the peoples of Northampton County have done for thousands of years. Visit the TWIPA web site next week when we will be featuring some of the interesting history and archaeology of Northumberland County. Fehr, Eleanor, Doris Freyermuth, Mr. and Mrs Jos. Lopresti, Mr. and Mrs. Donald Kline, and with additional comments by Barry C. Kent. 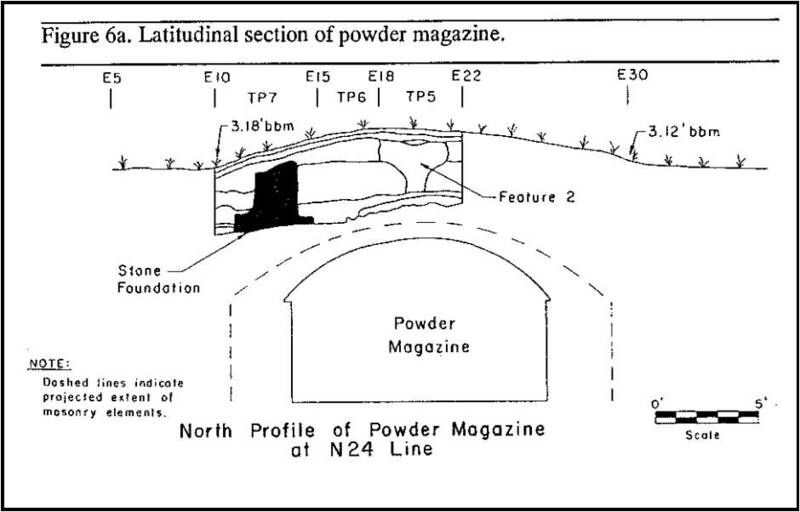 1971 The Sandts Eddy Site (36-NM-12) Pennsylvania Archaeologist 41(1-2):39-52. 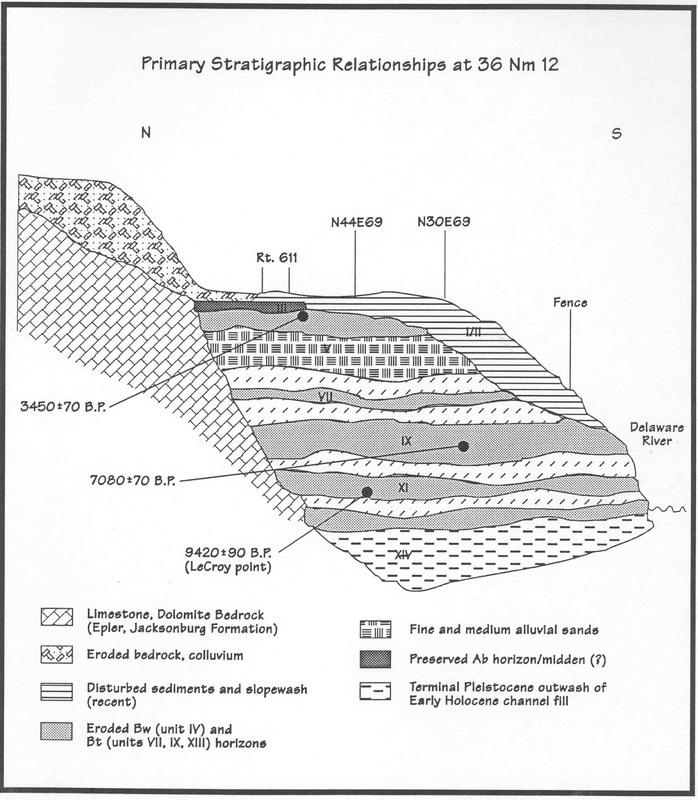 1994 A Young Archaeologist’s Summary Guide to the Deeply Stratified Sandts Eddy Site, Northampton County,Pennsylvania. This week we share with you some thoughts from the second of our two college interns this semester. Our interns were great this spring and provided an enormous amount of support for tasks associated with analysis and curation of collections. These students offer a fresh perspective to the curation process and often provide valuable suggestions. We applaud and thank both Krissy Kramer our intern and guest blogger this week and Sean O’Hara from our blog on May 3, 2013. I’m Krissy Kramer. I am majoring in Public History and minoring in Anthropology at Shippensburg University. After volunteering with the Pennsylvania Historical and Museum Commission’s Section of Archaeology for a year-at Fort Hunter, the Farm Show, and in the lab- I decided I’d like to try my hand at an internship. Working with the State Museum, the archaeology lab works to preserve, interpret, and provide the public with information focused around our archaeological heritage. Not all history is written down. History that occurs before writing is deemed prehistoric. As a result, an archaeology site may consist of prehistoric or historic artifacts, or a combination of both. The site that I was specifically looking at was City Island (36Da12), a prehistoric site that also included later historic occupations. 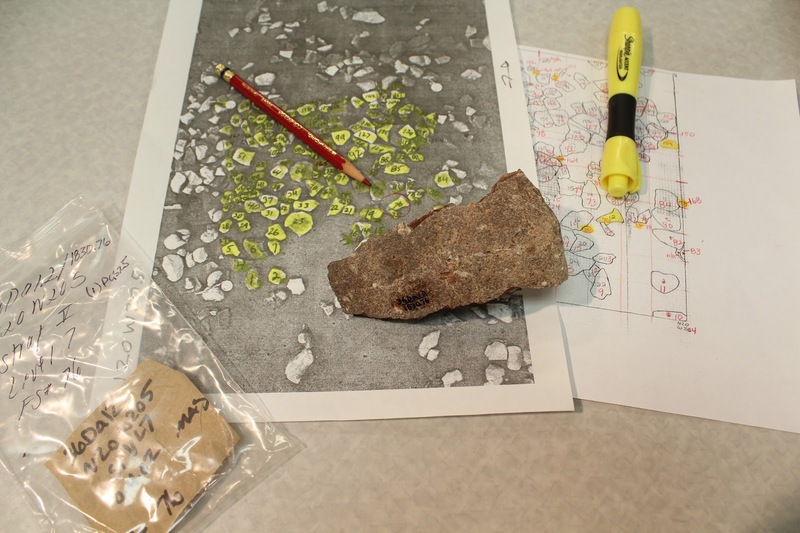 As a result, I've dealt with looking at a majority of prehistoric artifacts and ecofacts such as fire-cracked rocks, projectile points, hammerstones, animal bone, and debitage. However, I also identified several historic artifacts such as various glass and ceramic vessels but also nails and the occasional coin, comb, or button. From cleaning artifacts, to identifying, labeling, and preserving, this internship has taught me that although tedious, context means nearly everything to the archaeologist. Attention to detail, organization, and patience are key traits to working as an archaeologist. As history often incorporates written documents and artifacts, it’s important to study and preserve artifacts correctly in order to fill in the gaps that exist in the written documents. Similarly, many written documents or oral histories may express biased accounts or exclude certain aspects of a peoples or a culture. So by enhancing these traits I am better able to understand what it is like to be a detective, an archaeologist, a historian. These traits are beneficial to a plethora of careers. With that said, these traits will better prepare me for future careers. While I am highly interested in public history, this internship has provided me with a wide array of tasks accompanied by explanations as to why they are necessary in addition to another field that may coincide and intertwine with public history. Like many other fields, concepts and ideas are always changing. Archaeological and museum standards continuously change as well. I have thoroughly discovered the challenges of dealing with an excavation that has extended over several years and have been processed to varying degrees of completion. As a result, Andrea, my mentor, and I have taken nearly three months to correct and update all of the artifacts from site 36Da12. To bring the collection up to current standards, we corrected and updated artifact inventories, and rehoused artifacts and ecofacts for long term curation. We also edited existing catalog information for digital entry into Microsoft Access. In addition to sorting out these inconsistencies in the collection, we applied the current artifact coding system of The State Museum of Pennsylvania for inventory purposes. In other words, this code is unique only to their archaeology lab and so we needed to properly catalogue the artifacts and their codes and label their bags accordingly. Needless to say, site 36Da12 required a lot of tender loving care. Although the project is still ongoing, Andrea and I, with the help of other lab volunteers, have bagged, coded, preserved, labeled, boxed, and cataloged nearly all of the artifacts from both the prehistoric and historic levels of occupation at the site. Because of this, I became more familiar with Microsoft Access databases, identifying lithic materials and types of artifacts, correct archival materials for storing artifacts, cataloguing color slides, finding artifact proveniences based off of photographs and grid drawings, and more. In addition to focusing on 36Da12, I was able to assist several other archaeologists and perform various tasks throughout my internship. On certain days, I would assist an archaeologist on another project; often times the site that they are currently focused on. One such task involved uncovering specific artifacts that were provided to the lab by PennDot. Another task involved rehousing artifacts to ensure its protection and preservation. Furthermore, I assisted in storing artifact boxes in the storage area, studied artifacts under a microscope, and helped prepare and photograph artifacts in the photo room. My internship in the lab was a wonderful experience. The staff welcomed me into this internship with open arms, treated me completely like any other member of their staff, and taught me so many details that can only be learned through hands-on experience. They never failed to answer my questions and provided me with the confidence to perform tasks that I wouldn’t have thought possible since I have not had much experience or knowledge in archaeology. After this internship, I will be interning at the Cumberland County Historical Society to design the upcoming exhibit “Treasures from the Archives” while attending an archaeological field school in Belize focused on studying the Classic Maya Period. I hope to continue working with my archaeology family in the lab and eventually gaining a career related to public history in some way or form. Join our senior curators Kurt Carr and Janet Johnson as they take the dugout canoe on the road again. This Saturday, May 18th, they will be at the grand opening of the Lancaster Longhouse located at the Hans Herr House and Museum, 1849 Hans Herr Drive, Willow Street, PA. Come check out the replica canoe and the traditional tools used in it's construction from 10:00 AM to 4:00 PM. For more information about the event visit the following websites. Lancaster Longhouse or Hans Herr House. The Tuscarora Nation is celebrating the 300th anniversary of their journey home by retracing the steps of their ancestors along a 1300 mile trail. This week in Pennsylvania archaeology we are going to report on a visit from some very special people. On May 7, members of the Tuscarora Indian Nation visited The State Museum of Pennsylvania. They are part of a group of young people who are celebrating the 300th anniversary of the Tuscarora’s journey home. Some of you may remember the Tuscarora visit in 2010. That event celebrated the meeting in 1710 where a delegation of Tuscarora Indians was dispatched from present day North Carolina to deliver a set of wampum belts to the colonial Governor of Pennsylvania. The delegation was seeking permission to relocate their people to Pennsylvania to avoid a war with colonists in North Carolina. The meeting was held on June 8th at Conestoga Town, Manor Township, Lancaster County where representatives sent by Lt. Governor Gookin and the Provincial Council met with the Tuscarora. The Tuscarora carried eight wampum belts symbolizing their desire to have safe lands for their children to play and young men to hunt, protection from slavery, freedom to travel in order to gather wood, food and water, and that they might find peace with their neighbors and the Provincial Government. The Governor and his representatives acknowledged the plan of the Tuscarora to live peaceably and granted them a safe place to live. The Tuscarora are Iroquoian speakers and they believe they left their ancestral homeland in present day New York for the Carolinas between 700 and 900 AD and this is supported by archaeological evidence. At the Conestoga Town meeting, members of the Iroquois Confederacy invited the Tuscarora to move to their lands in New York rather than stay in Pennsylvania. War delayed the move but following its end in 1713, the Tuscarora started migrating north through Virginia and eventually the Susquehanna Valley. The Tuscarora Nation was admitted to the Iroquois Confederacy “on the cradleboard” (meaning that one of the five nations represented them in council meetings) in 1722 but the duration of the move lasted over 50 years. In their sojourn through our state, the Tuscarora left a lasting legacy which honors their nation in the names of towns, streams and mountains. The Commonwealth appreciates their contributions to our heritage and wishes to strengthen our ties with the Tuscarora Nation. The Tuscarora Indian Nation is a federally recognized nation, acknowledged by the Federal Government as having a government to government relationship with the United States. To commemorate the 300th anniversary of their journey home, the Tuscarora Nation sent some of its young people to retrace the steps of their ancestors along the trail. They began their journey on March 24th, 2013 at Fort Nooherooka, Snow Hill, North Carolina and will finish their trip 1300 miles later at the Tuscarora Nation, located in Lewiston, New York near Niagara Falls on June 1st. Their goal is to share the Tuscarora story of amazing indigenous survival; bring attention to climate shift and raise awareness about the need for more "human-powered" movement. They followed the Tuscarora trail through Virginia, West Virginia, Maryland and southern Pennsylvania by hiking, biking and running. They have covered about 700 miles in 40 days. Using a relay race strategy, they ran into Duncannon, Pennsylvania this weekend. On Tuesday, staff from the State Museum escorted them to Lemoyne Middle School for a presentation to about 120 eighth graders. They described their journey, including allowing students to carry their backpacks. They also described life on the Tuscarora reservation and there were many questions. Marta Hamme, the teacher who organized the presentation, told us later that the students continued talking about the journey and Tuscarora culture for the rest of the day. Next, they gave a presentation in Memorial Hall at the State Museum. With approximately 200 students in attendance, there were many questions and we are sure those 4th graders went home and told their parents about seeing real Indians at the State Museum. At lunch we were joined by Francine Patterson, Clan Mother of the White Bear Clan and her husband, Neal Patterson who served as spokesperson. Afterward, there was a presentation in the State Museum to a mostly adult audience. The Tuscarora talked about climate change and how the forest environment changed as they traveled north along the Tuscarora trail. As a result of global warming, the current climate of North Carolina will gradually move north also. The flora and fauna of their home in western New York will move towards Quebec. The vegetation and animals will change. What should the Tuscarora do? – move north or stay and adapt to their new surroundings. They also discussed what they had learned about “human powered movement”. Every time someone walks or bikes to school or a store or work they are reducing our dependence on fossil fuels and contributing to a safer environment. Finally, Francine Patterson is one of the most fluent speakers of the Tuscarora language. She has developed a dictionary and spoke on the importance of maintaining her native tongue. The language is taught in the elementary school on the reservation but there are few speakers. During the twentieth century, the speaking of Native American languages was generally discouraged. However, language is very important in maintaining cultural traditions and the practice is making a comeback with many Native American cultures. It was interesting that our invitation for the afternoon presentation to the public seemed to reach a number of individuals from the local Indian community. This is good because it represents a positive and non-confrontational interaction involving these groups. Later, we took the Tuscarora through the gallery and our lab. It was assumed that they would be tired but they stayed in the gallery until after 4:00 and we didn’t leave the lab until after 6:00. It was a good day for the State Museum and the Tuscarora. 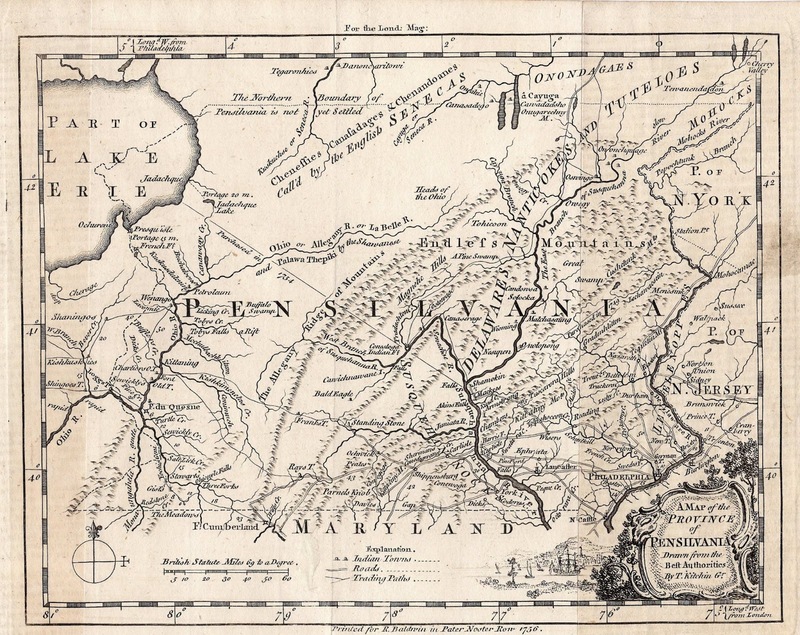 The Tuscarora were attracted to the Commonwealth by the welcoming policies initiated by William Penn and that prevailed in the Commonwealth during the early 1700s. The meeting at Conestoga town 300 years ago was the beginning of a new life for the Tuscarora Nation. They were able to escape the strife in North Carolina and establish a more secure home in the Iroquois Confederacy. In granting them safe passage through the Commonwealth, we greatly facilitated this move. It is part of their heritage and also a significant part of the Commonwealth’s heritage. We feel this was an exceptional opportunity to celebrate the cooperation between the Commonwealth and the Tuscarora Nation in the same approach as our Provincial Government 300 years ago. 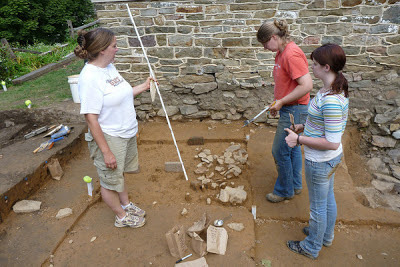 This week we welcome a guest blogger to our growing list of blogs and delay the return to our journey across Pennsylvania’s archaeological landscape by county. The Archaeology Section has been fortunate to have two interns this semester, Krissy Kramer from Shippensburg University and Sean O’Hara from Elizabethtown College. Both of these students have done a fantastic job with their various tasks and projects and we appreciate their dedication and contribution to the “team”. Please take this opportunity to read about Sean’s experience with the Section and if you are a student, think about joining us in the future for an internship. My name is Sean O’Hara. I am a senior Anthropology/Sociology major at Elizabethtown College and will be graduating this May. For my last spring semester I interned with the Pennsylvania Historical and Museum Commission, Section of Archaeology located in Harrisburg. I hope after graduation to find a job in research, data management or an analyst type job. After taking a yearlong intensive research class in the Anthropology/Sociology department and writing over a dozen research papers as an Anthropology major, I became really interested in doing a research oriented, internship program. The first few weeks of my internship were spent helping Dr. Kurt Carr with his research on Paleoindian fluted point sites by creating data tables for his analysis. I gathered up a series of reports that he was using and collected information on the number of tools and their respective lithic material type. 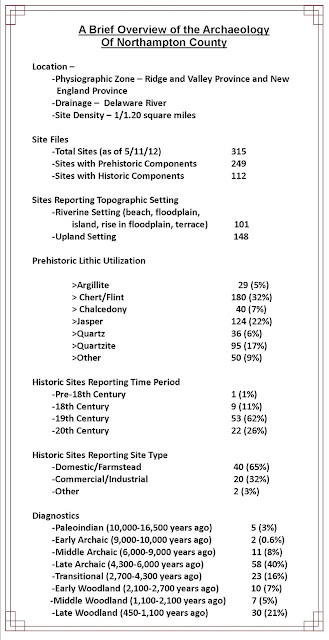 Using this information I created tables of Pennsylvania sites with fluted points and other tools, such as endscrapers, that the Paleoindians used. The sites ranged in size from only a few dozen tools to thousands of stone tools. Some of the reports contained tables, but others required careful reading and recording of the tool quantities. Attention to detail was important to make sure that I did not repeat any numbers when a report didn’t include a table. 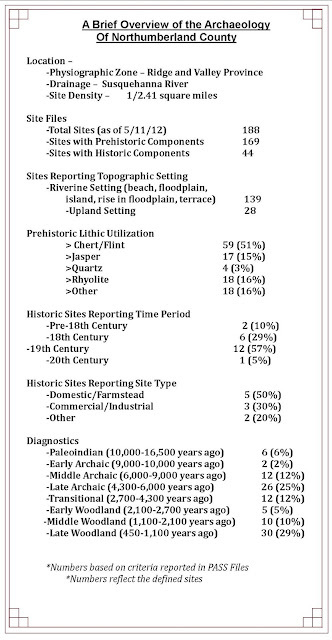 I also helped Dr. Carr review his list of Paleoindian sites in Pennsylvania and clean up the database. This took several days to thoroughly review and required comparison with research databases and site recording data in the Cultural Resources Geographic Information system (CRGIS). This exercise was important to insure that the analysis was based on accurate figures. As expected, this was a time consuming undertaking that Dr. Carr hadn’t been able to complete given the demands of his schedule. It was during this project that I noticed that the physiographic codes for the sites were wrong. Due to a change in data codes in the GIS system, it became apparent that some of our data was using both the old and new codes. Consequently, this required conversion of the codes and data alignment between the two systems. I assisted Janet Johnson with some research on early bottle seals. She had two old glass bottle seals that required identification. I started off by taking pictures of them, and then tried to identify the writing on each. One of the seals had a clear picture so it did not require much of an effort. The seal had a “B” in one corner, a picture of a distiller, and a “2” in roman numerals in another corner. The “B” was the easiest to identify, the “roman numeral 2” however took a bit of work to identify. Janet and I looked at it under a magnifying glass and a microscope to try and figure it out. At first we thought it was an “H” but the middle of the “H” after a time made us think otherwise. The picture of the distiller threw us off at first but the device looked familiar to me. I looked it up online and realized it was a distiller. I had seen it before when I was a chemistry major. I spent the rest of the day looking up which company could have made it. Janet knew that it had to have come from the 17th or 18th century. My research into this did not turn up much, just that the letter and number represented the model number. Sadly, I could not find the name of the company. Throughout my internship I performed a wide variety of other jobs such as data entry, cataloging and I even got to do some field work at Fort Hunter in the middle of last winter, but research was by far my favorite. Overall, my internship here was a great experience. I met and worked with a great bunch of people and learned a lot. I hope this experience will help me in the future especially since I will be graduating soon and will need a job. I had the opportunity to do a wide variety of tasks but I really enjoyed doing the detailed research. I would recommend interning at the Pennsylvania Historical and Museum Commission, Section of Archaeology to anyone interested in the field of archaeology or anthropology. Thanks to everyone whom I had the pleasure of working with for a wonderful and memorable experience.